This evening, I passed two homes that were already decked out in Christmas lights, and it's not even Thanksgiving yet. Personally, I prefer to have my full three weeks of giving thanks, before I start to think about decorating for Christmas. 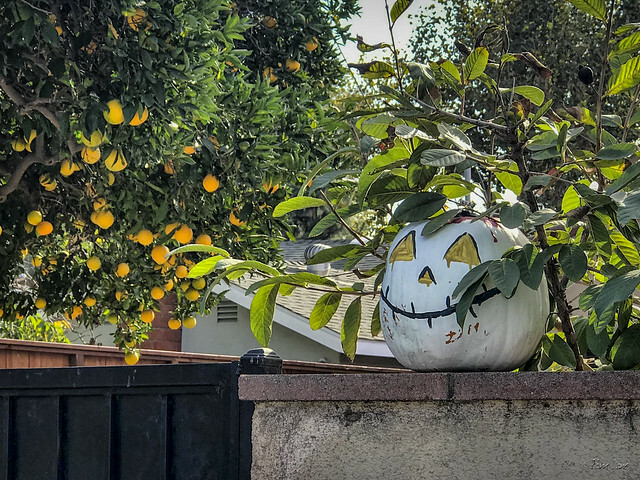 But earlier today, I passed this silly pumpkin almost hidden in the branches, and realized that it's not just Christmas that encroaches on Thanksgiving. The squeeze comes from the other side, too, with leftover Halloween peeking out when you least expect it! It's one big two month long mash up these days, HallowThanksMas, when Jack O'Lantern and Tom Turkey round up the pilgrims to pull Santa's sleigh. LOL We need to slow down and enjoy each opportunity to celebrate! Miss your photos, but I understand. I tried a blog and it lasted a few days!